I'm not about to try and change the classic pecan pie. I don't eat it often so I'm just going to revel in the sugary, sticky and rich goodness of it and enjoy every last bite! 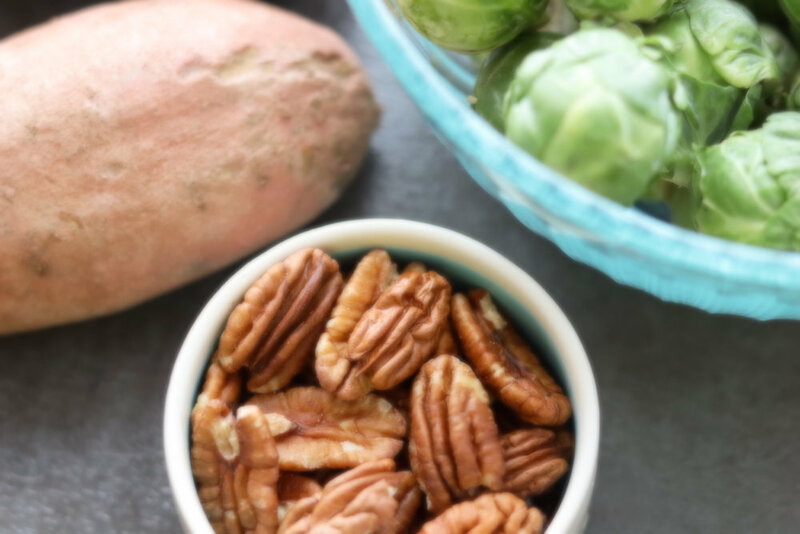 I did, however, create two recipes that echo the wonderful flavors of pecan pie - a crunchy breakfast treat or snack and a nourishing side dish using two of my favorite vegetables. A rare snow day in Alabama led to an unexpected, but welcome, day at home last week to experiment with some recipes. Living in the South (and the Deep South at that! ), snow days are few and far between. Most people here, including myself, don't know how to drive on snow and our pulse quickens at the mere mention of snow. A few years ago, during the Snowmageddon of 2014 (yes, that is what it is referred to), I, along with thousands in Birmingham were stuck at work when an unexpected snow/ice storm blew in - one minute I saw a few snowflakes out of my office window, less than an hour later, the roads were covered with a sheet of ice! Cars were stuck on the interstate and side roads, kids were stranded at schools and many of us stranded at work. Watching Netflix on my computer screen while sitting in my office chair is not near as much fun as watching it curled up on the couch at home with a mug of hot apple cider! While I wasn't thrilled to sleep on my office floor, it sure beat being stuck in my car on the road. I was also thankful (and amazed) that my dog Harry survived over 24 hours in the house with no accidents! This time around we had a little more advanced warning, although it ended up much more snow that the weather forecasters were predicting. Any snow in Birmingham is unusual, especially 4-6 inches, and in December to boot!! Schools and businesses closed and we could play in the snow and watch beautiful thick, fluffy flakes coat the trees and rooftops. Harry looking at all the snow!! My husband, Patrick, brought home a bag of pecans he picked up off the ground from a pecan tree at his wood lot. After a rather prolonged search for my grandmother's nutcracker (and a sweet, old bowl of hers), we got to cracking. 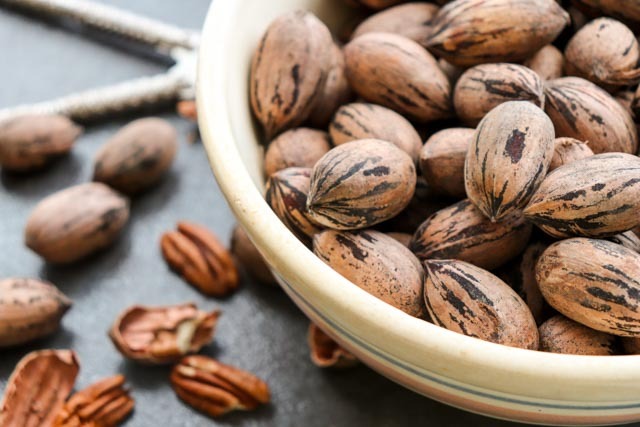 Pecans are one of my favorite nuts - although to be honest, I love ALL nuts! Slightly buttery tasting, they are wonderful toasted and tossed on a salad or just a handful for a snack. Pecans are healthy too! 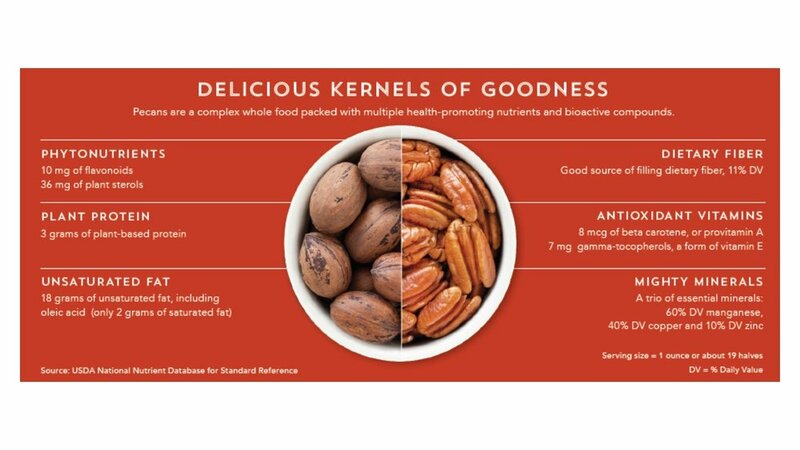 Several large scale, observational studies have found that frequent nut consumption, including pecans, was associated with a reduced risk of several major chronic diseases such as heart disease and type II diabetes mellitus. 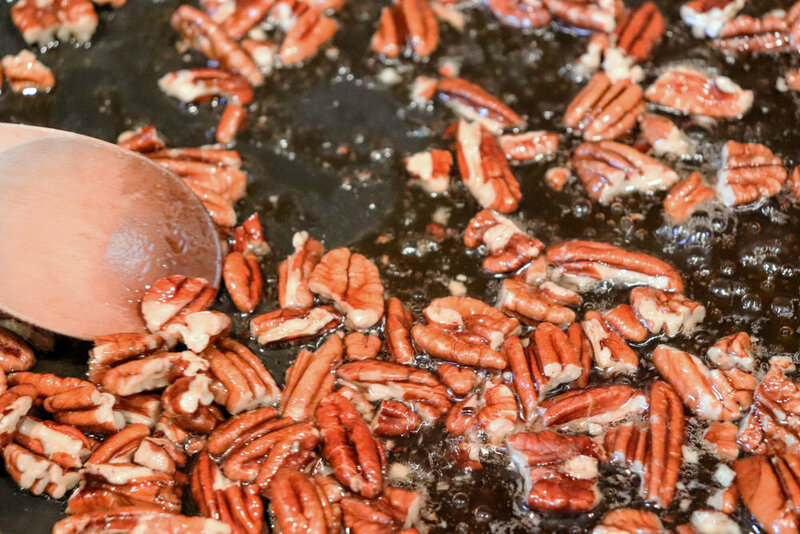 The first "pecan pie" inspired recipe highlights pecans in an easy and quick skillet granola. This small batch granola just has six ingredients! You can doctor it up with more add-ins but the simplicity of it appeals to me. Loosely adapted from a Rachael Ray recipe, I increased the pecans and used coconut oil in place of butter. While still a saturated fat, coconut oil contains medium-chain triglycerides (MCTs) which are broken down differently from other fats and less likely to be stored as fat. Personally, based on the research I've reviewed, I'm still not convinced that coconut oil is the "cure-all" that you see all the claims for, but, using in place of butter in recipes such as this adds an additional slightly sweet, nutty flavor. (It is also great as a hair and skin conditioner!). The second recipe glazes sweet potatoes and Brussels Sprouts with pecan pie flavors. Coating the vegetables with olive oil and maple syrup and then roasting at high heat caramelizes the Brussels Sprouts. I love the little crispy bits of leaves that fall off the Brussels Sprouts! Tender sweet potatoes, a slight bite to the Brussels Sprouts and crunchy pecans, we almost ate the entire pan in one sitting (just the two of us)! Preheat oven to 425 degrees Fahrenheit. Wash and cut the ends of the Brussels Sprouts, if needed. Cut in half vertically. (Some leaves will fall off but they just get a little crispier). Place the Brussels Sprouts and sweet potatoes on a large baking sheet. Drizzle with olive oil and toss to coat. Add the pecans, drizzle with maple syrup and sprinkle with salt and pepper. Mix gently so everything is coated. Bake for 15 minutes, stir and cook for an additional 10-15 minutes or until sweet potatoes are fork-tender. Enjoy classic pecan pie if you can (it is the holidays after all! ), but also try recreating that flavor in these healthy and nourishing recipes!